November 2014 Archives - Clarksville Sports Network - Clarksville Tennessee's most trusted source for sports, including Austin Peay State University. Clarksville, TN – The Clarksville High School Cheerleading Booster Club will be holding their inaugural 5K Rivalry Run Sunday, December 14th in the Industrial Park at 2:00pm. 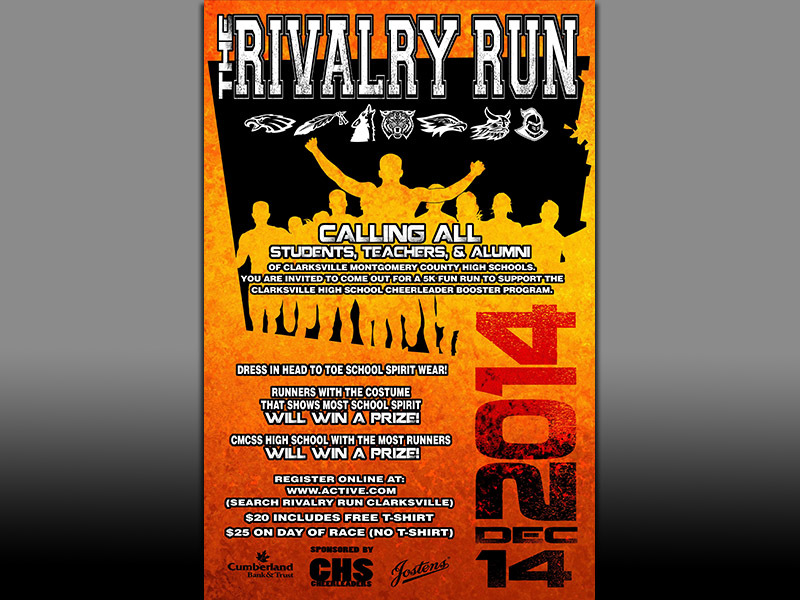 Students, alumni, faculty, and parents of CMCSS high schools are encouraged to come out and participate in a fun run, representing their school by dressing in school colors. The most flamboyantly dressed runner wins a prize as well as the school with the most in attendance will win a cash prize and some other items. Hattiesburg, MS – Austin Peay State University women’s basketball team was unable to find an elusive road victory, dropping a 73-60 nonconference decision to Oral Roberts, Saturday, in the consolation game of the Southern Miss Thanksgiving Invitational at Reed Green Coliseum. Las Vegas, NV – Stephen F. Austin advanced to the third round of last March’s NCAA basketball tournament. 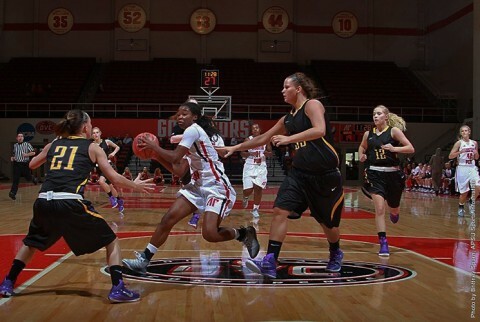 Austin Peay State University found out why Friday. 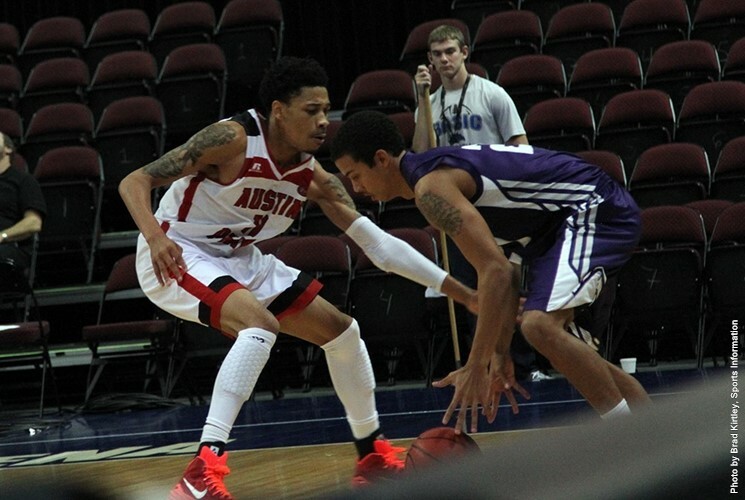 The Lumberjacks, who return most of their players from a 32-winn 2013-14 team, shot 63 percent from the floor while limiting the Governors to only 42 percent shooting as APSU fell 83-62 in the upper division title game of the Continental Tire Las Vegas Invitational. 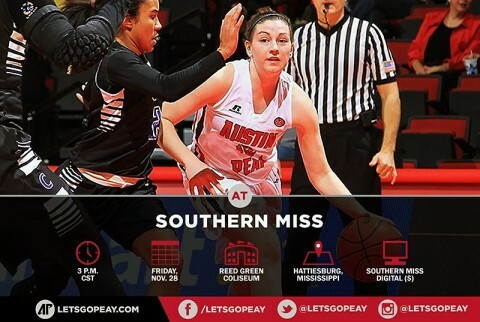 Hattiesburg, MS – Austin Peay State University women’s basketball team dominated the bulk of action but a nine minute span in the first half proved its undoing in a 80-71 nonconference loss to Southern Miss, Friday afternoon, at Reed Green Coliseum. 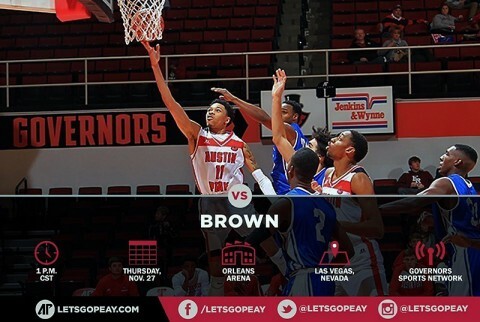 Las Vegas, NV – Austin Peay State University’s basketball team scored a season-high 79 points but that was the last thing anyone was talking about as the Govs snapped a three-game losing streak with a 79-58 Continental Tire Las Vegas Invitational victory, Thursday morning, against Brown in the Orleans Arena. 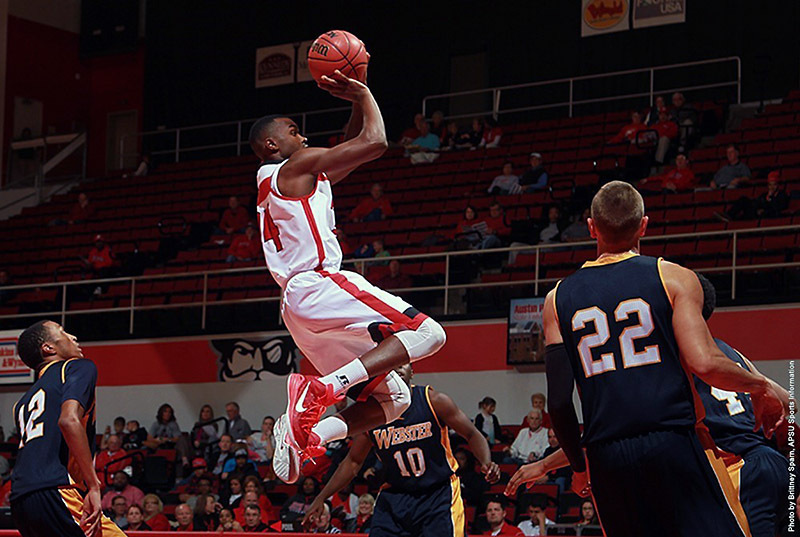 No, it was the other end of the floor—the defensive end—that saw the Govs erase a five-point halftime deficit in outscoring Brown 46-20 in the final half. Hattiesburg, MS – Austin Peay women’s basketball team will spend the Thanksgiving holiday at the Southern Miss Thanksgiving Invitational, beginning with a 3:00pm, Friday contest against host Southern Miss. 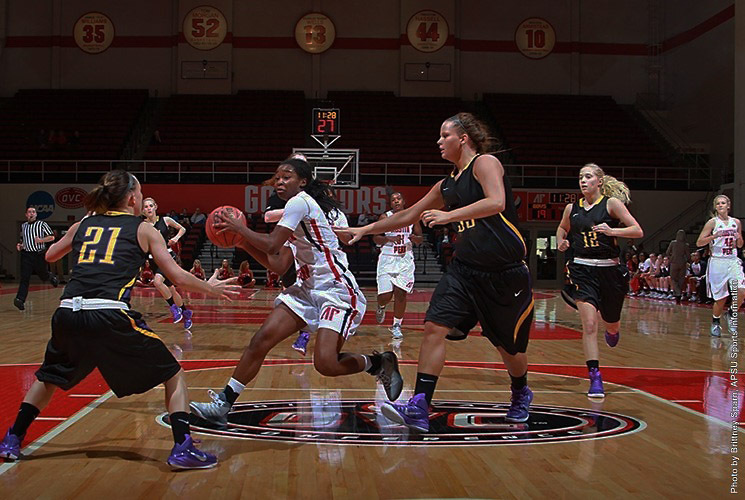 The Lady Govs then will face either North Carolina A&T or Oral Roberts in a Saturday contest. 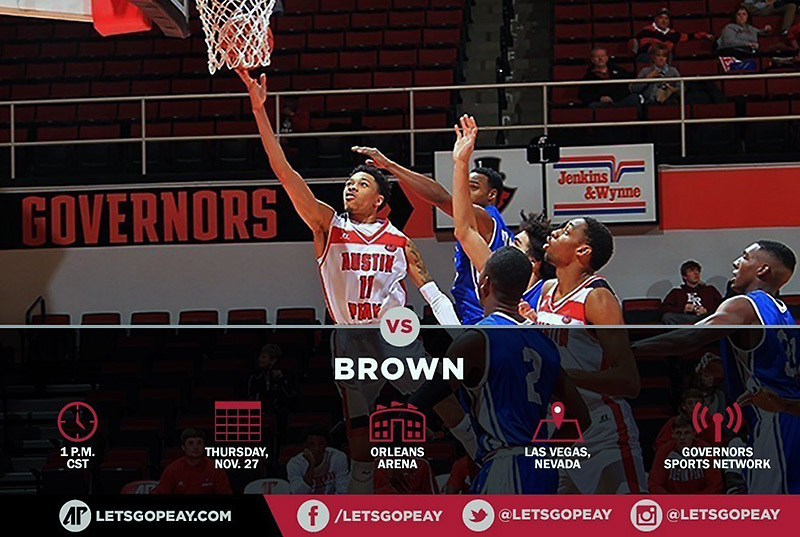 Las Vegas, NV – A streak will end for either Austin Peay State University or Brown when the two meet, 1:00pm, CT, Thanksgiving Day, in the Continental Tire Las Vegas Invitational at the Orleans Arena. The Governors enter the Vegas part of the invitational 0-2 in tourney prelim games as part of a three-game losing streak. 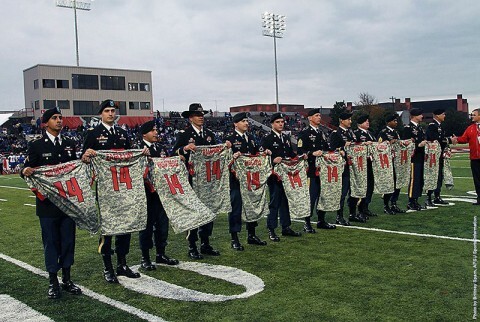 Clarksville, TN – The Govs Camouflage Football Jersey auction ended at noon, Wednesday, November 26th, with 82 of the 102 jerseys receiving at least one bid. 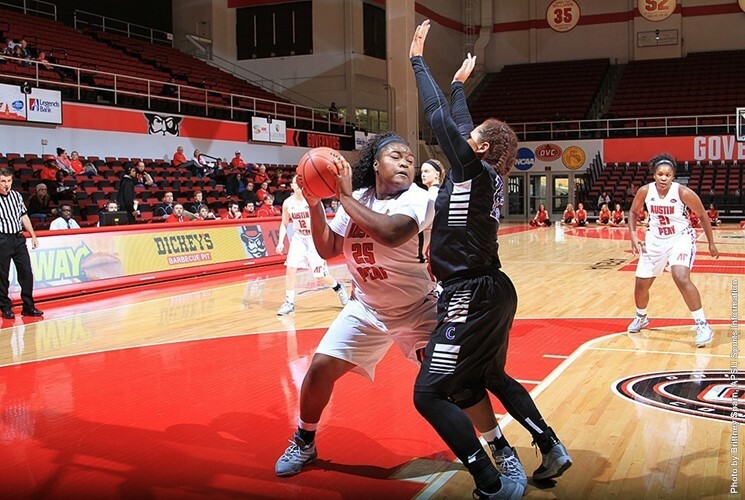 The Austin Peay State University athletics department wants to thank everyone who took part in this one-of-a-kind opportunity. All net proceeds from the auction will benefit the Wounded Warrior Project and we will announce that total when all orders have been finalized. Clarksville, TN – Teal Young hit one-of-two free throws after being fouled as the final buzzer sounded, Tuesday, November 25th at William Workman Gymnasium, to lift Clarksville High School’s boys basketball team past Gallatin High School, 49-48. Clarksville High (3-3) had led 48-44, with 43 second left following a running floater by Evan Cooper, but Gallatin cut the lead to two points on two free throws by DeDarius Redding, with 33 seconds left. 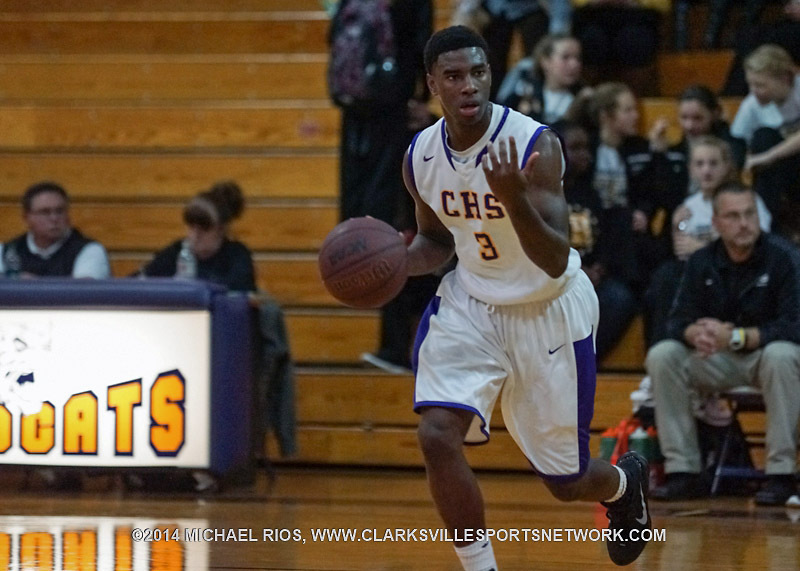 Clarksville High Boy’s Basketball gets last second win over Gallatin. 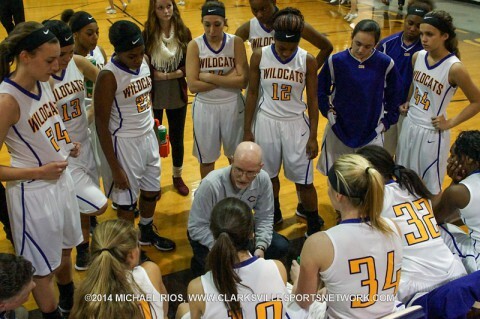 Clarksville, TN – Clarksville High School girls basketball team cut an 18-point first-half deficit to Gallatin High School down to just two points in the fourth quarter, Tuesday November 25th at William Workman Gymnasium, but couldn’t clear that final hurdle in a 60-50 loss. The Lady Wildcats (0-6) were buried under a barge of 3s by the Lady Green Wave in the first 5:30 minutes of the game, with Gallatin (4-2) hitting five shots from beyond the arc to build a 23-5 advantage. Clarksville High Girl’s Basketball loses to Gallatin 60-50 Tuesday night.